Parathyroid tumors may look benign (harmless) under a microscope, but they damage many organs in the body over time-making hyperparathyroidism act more like a cancer tumor. While parathyroid cancer is extremely rare, benign parathyroid tumors causing high blood calcium can mimic the effects of cancer. "It's a benign parathyroid tumor. Why do we need to remove it?" Phyllis's doctor in Virginia offered her a course of observation of her parathyroid tumor (an adenoma). "It's not parathyroid cancer, after all. You can just live with it!" So the story goes… for 11 years! We compiled all of Phyllis's blood calcium levels for over a decade. They are all high (above 10 mg/dl). Adults over 35 years old should have calcium levels in the 9's. Phyllis, a 73-year-old retired high school principal, was set on a course of blood tests every 6 months or so to see if anything changed-namely, her calcium level. Meanwhile, she felt terrible: tired, achy, cranky, unable to sleep. Her neurologic system was being impacted. The brain doesn't like running on calcium levels above 10-it slows down. Memory, sleep, concentration, and energy all suffer. Hyperparathyroidism causes extreme fatigue-it's the #1 complaint! This was all the work of a parathyroid tumor, but since it is not parathyroid cancer, removing it was not proposed as a solution. Yes, parathyroid tumors are benign, but they are up to no good, so to speak. They produce parathyroid hormone (PTH) in excessive amounts. The PTH then goes to the bones and pulls the calcium out of the bones. Over years this leads to osteoporosis and can actually feel painful (i.e.., bone pain). Have a look at our animated video that shows the features of hyperparathyroidism beautifully. The high blood calcium that characterizes parathyroid disease wreaks havoc on our entire body. How do we know it's not parathyroid cancer? Because we have seen over 20,000 cases of hyperparathyroidism, and only 3 of them were parathyroid cancer. The blood calcium level is not 10.2-10.9 in patients with parathyroid cancer; it's 14.2 or 14.9-something off the charts! PTH levels are not 189, like Phyllis's. It's 1289-you want to have the blood tests repeated because it looks like a lab error. Blood calcium levels in patients with parathyroid cancer don't look like the ones we listed in the table to the right. These are Phyllis's-see how they are all in the 10s. Importantly, even if your calcium is 13 and your PTH is 1000, you still most likely have a VERY OLD parathyroid tumor, NOT a parathyroid cancer! On with her story. Her kidney function deteriorated as the parathyroid tumor, again not technically parathyroid cancer, kept the blood calcium level in the high range. Phyllis then saw a kidney doctor (a nephrologist), who was also not prompted to get this thing out of her. Her cardiovascular system started feeling the effects as she developed atrial fibrillation and hypertension-and she added a cardiologist to her list of doctors. The high blood pressure recently required a third medication to control it. She was later found to have anemia and a low platelet count. Blood components like red blood cells and platelets are produced in the bone marrow, which was being assaulted for over a decade by excess PTH. It's no wonder the bone marrow ultimately failed. Phyllis's daughters saw her get weaker and weaker, moving from a walker to a wheelchair as her muscles succumbed to the "benign" parathyroid tumor that seemed to be acting like parathyroid cancer, even if it wasn't officially supposed to be called that. This was more than they could bear, so they consulted "Dr. Google". Searching for high blood calcium directed them to the "High Calcium" page of Parathyroid.com, leading them to a wealth of information about parathyroid tumors, blood calcium, hyperparathyroidism, and all of the heartbreaking symptoms they had been seeing in their mother. They downloaded the Calcium-Pro App for their iPad and plotted out the data, running the analysis for themselves. This app made things perfectly clear for them (that was our goal!). The graph on the left is one of the many ways the Calcium-Pro App graphs and analyzes your calcium, PTH, vitamin D, urine calcium and osteoporosis. 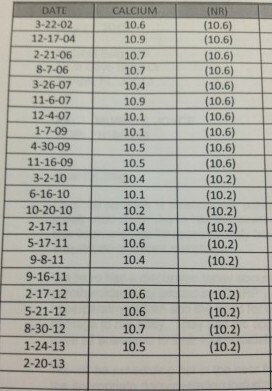 This graph shows all of Phyllis's blood calcium levels for the past 10 years. 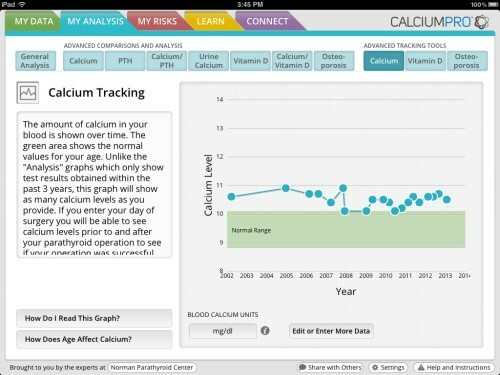 The green bar shows the normal range for blood calcium for women her age (should be in the 9's). Anybody can see that she has a tumor-the question is why are we "just watching" it? They decided to give us a call and get her to Tampa. I spoke with them by phone and explained that often doctors are taught not to worry about parathyroid disease until the blood calcium gets to some higher "magic" number. Their professors declare,"The tumor is benign, so why remove it? Since it's not parathyroid cancer, we'll wait for something dramatic to happen like a kidney stone or osteoporosis." In fact, parathyroid adenomas like the one in Phyllis's neck, are not parathyroid cancer. For example, a piece is not going to break off and go set up shop in her lungs or liver or brain and start growing there. Thus these parathyroid tumors are "benign," in the strictest medical sense. Maybe it would be better if they were considered parathyroid cancer in name only, since this would surely lead to action! Nobody would ever say, "Mrs. Jacobs, you have parathyroid cancer… I think we'll just watch it and sees if it gets worse." Truth be told, there are some cancers a patient could have that would have a far better prognosis than hyperparathyroidism. Let's see: it causes a slow, steady decline of numerous organs over time, slowly debilitating the patient, rendering their lives sedentary and joyless. That sounds just like cancer! Parathyroid tumors are not malignant, but they may as well be, if they are going to lay claim to the heart, brain, bones, kidneys, etc. Recent data show that there are several other "real" cancers that occur at higher rates in patients with parathyroid disease. Cancers of the prostate, colon, breast, and kidney are all seen more frequently in patients with primary hyperparathyroidism. It's much more difficult to cure someone of these cancers. Many patients lose their lives to these other "real" cancers. Hyperparathyroidism is also fatal; it just takes 20-25 years to take the patient's life. Most importantly, parathyroid disease is curable! You can have the tumor removed. You can do something about this! Let's cure this curable disease! These large parathyroid tumors may not be parathyroid cancer under a microscope, but they are up to no good. They get pretty big and ugly, too. Get rid of it! 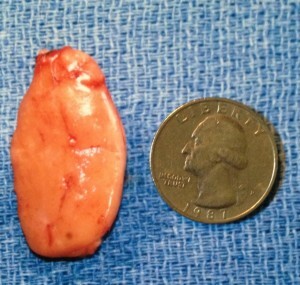 Phyllis came to Tampa, and had a whopper of a parathyroid tumor removed (see the photo!). It took 17 minutes to take this out and confirm that the other parathyroid glands were normal. She left the hospital a little over an hour later and has since returned home. The latest update from her daughters is a good one. She is gaining steam. She said to her older daughter the other day, "Throw that wheelchair away!" It warms my heart. Hyperparathyroidism is a chronic disease (it makes people sick over a period of time), but since the tumors that cause this disease are almost never parathyroid cancer, some doctors don't get alarmed-they just don't know any better. The lesson here is simple: parathyroid tumors are not harmless, even though they are technically benign. If you see what they do to patients over the course of years, you would conclude that they are not so benign in the way that they act. Parathyroid tumors will slowly strip away the health of one organ at a time-just like many cancers do. Parathyroid disease can be entirely cured by removing the tumor and confirming that the other parathyroid glands are normal (remember, your surgeon needs to examine at all four parathyroid glands during the operation if you want a high cure rate). We can't fall into the trap of thinking the patient can just live with hyperparathyroidism just because the calcium is "just a little bit high". If you live with it; you'll die with it. Simple as that. If you really need to read about parathyroid cancer, (but you really don't).